I’m very particular about vegetable stew. It’s such an easy recipe with straightforward flavours, but sometimes the simplicity really appeals to me and it’s the only thing I fancy eating. There are some dishes, curries and salads among others, that change according to what ingredients I have to hand at the time, and that’s such a fun way of cooking! – there must be onion, potato, carrots, broccoli and cauliflower. – celery is optional but welcome. – peas or sweetcorn can be used but NOT both, or the stew will be too sweet. – no fresh herbs for this one, the seasoning must be dried mixed herbs and a bay leaf. – vegetable stock must be made to full strength, not half strength as I usually do. Heat the oil on a low heat in a saucepan. Sweat the onion for 5 minutes or so until softened but not browned. 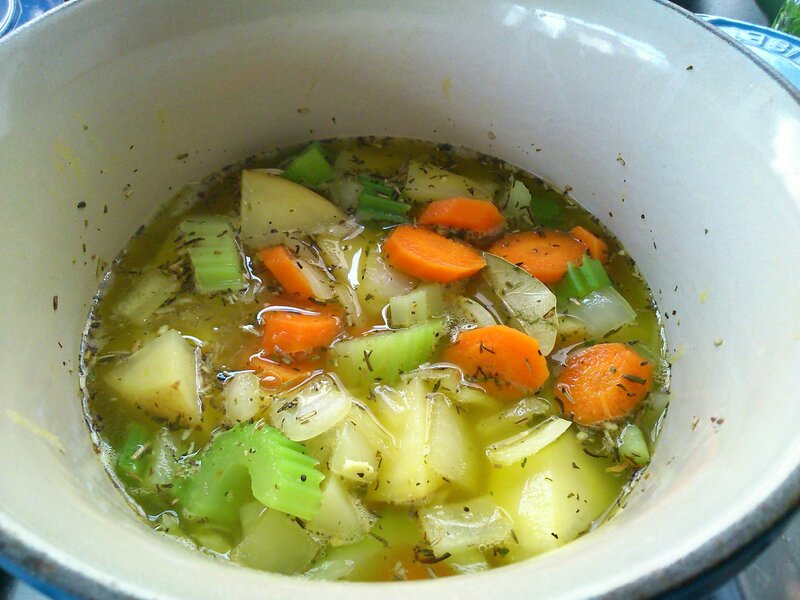 Add the potato, carrot, celery, stock, herbs and bay leaf to the pan. Bring the stock to a simmer and cook, partially covered, for around 8 minutes until the potato is starting to soften. 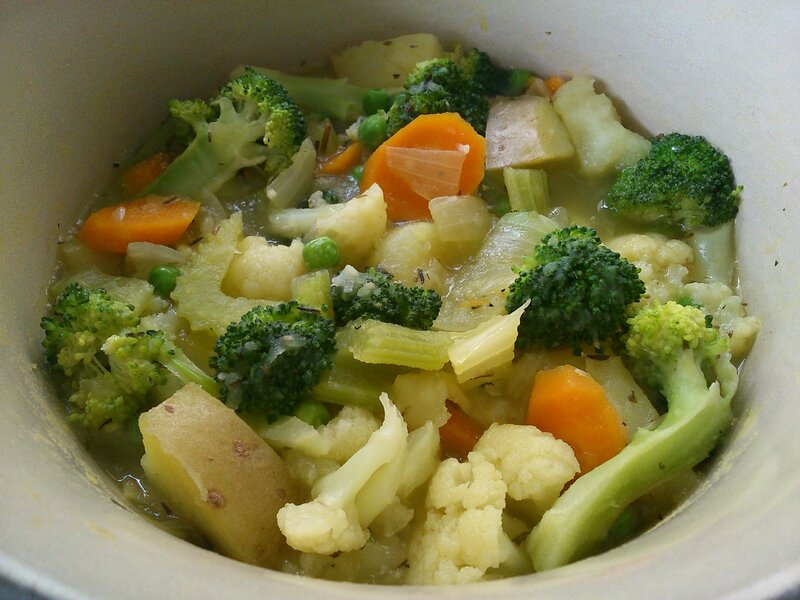 Add the broccoli and cauliflower, I like to mix the cauliflower through the stew but tuck the broccoli stalk side down into the stock so that the stalks cook through and the tops steam and stay crisp. Cover, and simmer on a low heat for 5 minutes until the vegetables are all cooked. The potato should be breaking down a little to thicken the sauce. Tip in the peas and heat through for a minute or two. Season with black pepper, and salt if needed. It’s winter over here in Melbourne so this recipe is perfect for those cold nights! Thank you!